My junior year of high school my English teacher had a large sign over her class room door which read “Be Ye Kind” it was an all-encompassing classroom rule. Her theory was if we could all just be kind to each other there would be no need for other petty rules, being kind meant being on time and prepared for class, being respectful of the other students, etc. and I feel it applies to every aspect of our lives. If you are kind (or at least try to be kind), I’d like to think it influences others to be kind as well, and the world could use a bit more kindness. Also, unlike Ferris Beuller, I like -isms. Why have you started Kindism? What do you hope to achieve? I started this page because I needed a place to think about my experiences in Christian Science and related CS-institutions, the process of leaving, and musings on the topic now that I have left. I’m not an expert on Ms. Eddy, or parenting, or religion, or navigating the healthcare field. I’m not trying to write a book, or start a revolution. I’m just someone trying to figure out what I just spent the last 20+ years of my life believing and make sense of things. Writing helps me to clarify my thoughts, and after so many years of being told what and how to believe I have a lot of thoughts to clarify. I would like to use Kindism to share my experience leaving Christian Science (and later my rejection of generic Christianity as well), and to chronicle my journey as I seek whatever it is I’m looking for (I’m still not sure). I’m still not totally sure what my end-goal is, I’m not actually sure if I have one. I know I felt very alone when I first left CS, no one else could quite relate to what I had been through, and as I’ve blogged more, I’ve learned I’m not as alone as I thought I was. There are other people out there struggling with the same issues I am – I’m just writing about it. I hope this blog has made a positive difference in someone’s life, and inspired them to think more deeply about the religion they are participating in &/or have been part of. Is “Kat” your real name? Kat is the shortened version of a nickname given to me by a close childhood friend. If I e-mail you, will you share my name &/or e-mail address and “no longer CS status” with the internet? I WILL NOT SHARE YOUR NAME, CONTACT INFORMATION, OR “OUT” STATUS WITH ANYONE. Guest writers are encouraged to pick an appropriate pseudonym. If you would like to be part of an active former-CS community, there is an Ex-CS facebook group (contact me for details). I want to help &/or contribute in some way, what can I do? Leave comments or e-mail me. It is nice to know that there is someone out there who reads this other than my BFF. Submit a guest post – have a Sunday School, camp, or Prin anecdote, tale of woe, work for a CS-related institution or want to share some other part of your CS story? Have some thoughts to share about a CS-related blog post? I’m open to ideas as long as it relates to CS in some way. You can leave a comment or e-mail me kat.at.kindism (at) gmail.com (yes, that is a complicated e-mail address, it cuts down on the spambots). Spread the word. When I started this blog I felt like I was the only one out there, now I know I’m not. 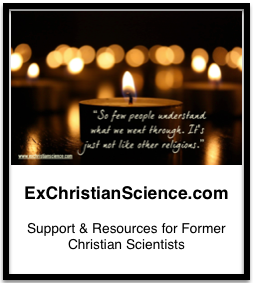 Are you still a Christian Scientist? No. I have not relied exclusively on CS for healing for a number of years, and have not considered myself to be an “active CS” for even longer. After 10+ years of membership, I finally got around to “voluntarily withdrawing” from the Mother Church. I self-identify as agnostic/atheist. Why did you leave Christian Science? I feel the way Christian Science is being practiced in it’s institutionalized form is no longer the best choice for me (or my family). I feel medicine has come a long way since the 1800s (when Christian Science was founded) and that prayer, while a valid choice in many situations, can (and should) be used in conjugation with responsibly practiced modern medicine. I also no longer believe in the Judeo-Christian God of the Bible upon which Christian Science is based. Why have you rejected Christianity? Short answer: I read the Bible and the God described was not one I wanted to worship. You link to CS-positive literature/websites. I think some of the CS-positive bloggers/websites have something to offer, while others are just so far from my experience in CS they are worth noting. Most websites that link to full-text copies of Ms. Eddy’s works are also generally CS-positive — not everyone is blessed with boxes full of Authorized CS literature that they can peruse at their leisure. I think Ms. Eddy and CS can offer interesting insight and inspiration (although they should NEVER be relied on as the sole source of healing), as can a number of other religious and cultural traditions. thank you so much for this! i went to the upper school and although i am very conservative i pretty much disagree with everything about prin! to me they are huge Hippocrates and tend to mind wash people. i too have a problem with the medical issues and know far too many people that have passed away (most recently scott alford at the upper school, in his 40’s.) from preventable diseases. Thank you for your blog. I look forward to reading more when it isn’t 3:00 a.m. where I am now! Will check in later. It means so much to me to be able to correspond with other people who have quit Christian Science. Where I come from, CS stands for two things: Christian Science and Common Sense. We go to the doctor. Our kids go to the doctor as well. I guess you could say we not DEVOUT Christian Scientists. But, there is a lot to be said for the beliefs in the religion. We drink caffeine, and other things that used to be against the religion, we realize some beliefs are outdated and need to be tweaked. But, overall, in my opinion, there IS no better religion. I have seen how CS can heal someone, I have experienced it myself. It does not good to second-guess the power of God’s healing power, as second-guessing is where you go wrong. Doctors were given the knowledge to do what they do from God. Doctors are there to help those who cannot help themselves. As far as Christian Science being hush-hush? From my experience, it is because of the ridicule Christian Scientists receive. I am not sure what else there could possibly be. Recently, my father was in the hospital (for the umpteenth time) and I proclaimed with pride that we are Christian Scientists. We actually weren’t looked at like amoebas or aliens! We were respected and given literature to help us with the situation. My father passed away during this visit. Not because of his belief in Christian Science, but because his body was shutting down. Organs were shutting down. He was 75, He was bedridden for quite some time, and it was a help to him to listen to the Lesson and put his thoughts in the right place. Mary Baker Eddy made a science out of learning about God and what God is all about. She wrote of her findings about what she believed were the correct interpretations of what she read, therefore creating the Science and Health – Key to the Scriptures. THAT is why it is called Science. It was studied. Christian Science is HER interpretations of the Bible and she would teach us how to apply what she learned. Funny, I am not even a devout Christian Scientist, yet I grew up with the beliefs and I understand them to an extent. My aunt is a practitioner and went to Boston to study to become a nurse practitioner. She understands better than any of us, yet she goes to the doctor, she uses medicine, she believes in God’s healing power as well. To us, Christian Science is a loving state of mind that puts full belief in the healing power of God, and when we apply common sense and realize we need extra help, we go see a doctor. I guess I’m just letting you know that not ALL Christian Scientists go as far as to solely believe in the healing power of God, and seek a doctor’s help who have the God-given knowledge to help us. I agree, “not ALL Christian Scientists” carry things to extremes, but I have seen enough of them that have, and I have seen/felt the direct impact on my/their families that I am not going to get involved with it as a religious choice.